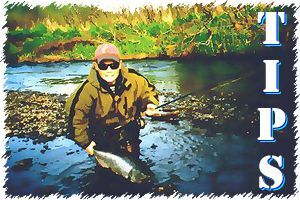 Every fly fisher in Alaska knows how successful egg-sucking patterns are for rainbow trout, Dolly Varden - char, and most species of salmon. 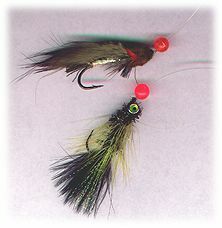 Many streamers, baitfish, and leech patterns have "egg-sucking" versions incorporated in their recipe and its the wise fly caster that stocks a hefty variety of egg-sucking patterns to go along with the traditional versions. But as we all know, fish can get very finicky at times, especially in popular fisheries that receive constant angler pressure. When everything in your fly box failures to crack the menu code for the day, try adding a plastic bead to your leader ahead of your fly. You can instantly convert any fly into an egg-sucking version, even if there is no such acceptable pattern in that design. Sometimes the never-seen-before fly can tip the scales for the angler. And too, the addition of the egg can change much of the characteristics of the presentation, perhaps stimulating a response from reluctant fish. Carry an assortment of sizes and colors in both plastic and glass. The latter can provide some additional weight at the same time and help put the fly "in the zone" without adding lead weight.